Elisa Whitman is involved in a multi-part community education seminar to help people prepare themselves and their families for a sudden accident or illness. As part of the workshop, Elisa presented a course on estate planning. The seminar was sponsored by the Beloit Health System Foundation at their NorthPointe Health & Wellness Campus. Pat Kasmar and her husband Barry braved the unseasonably cold weather to volunteer at the biggest local fundraiser for Special Olympics, the Polar Plunge! It was held at Olson Lake the first weekend in March. They said it was cold, but worth it! 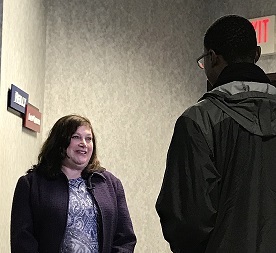 Elisa Whitman was interviewed on WREX-TV News regarding Rockford's newly proposed ordinance to create a vacant and foreclosing property registry. She spoke from our client's perspective and noted that "We don't know what it's going to cost our clients. They're going to have to pay twice a year to register any properties they're foreclosing on, they're going to pay for inspections of those properties, and they're going to have to bring those properties into compliance with the city code." Elisa was identified as a Reilly Law Offices attorney who frequently represents banks and credit unions when it comes to foreclosures. Bill spoke to community leaders in Rockford who gathered to recognize, celebrate, and honor Dave Rydell (Bergstrom CEO) and The ARC of Winnebago, Boone, and Ogle Counties for their Legacy of Service to the community. 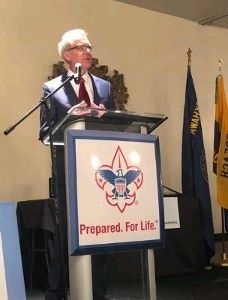 The annual event is hosted by Boy Scouts of America, Blackhawk Area Council to recognize individuals and organizations within the Rockford community that have shown a commitment of service to their community or country. Recipients are selected by other community members and volunteers. All proceeds of the event support Scouting for youth in difficult-to-serve areas of Rockford. Retired Major General John Borling was the Keynote Speaker. 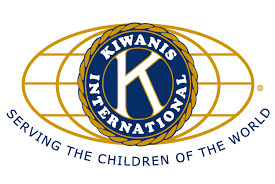 After Pat joined the Alpine Kiwanis, an organization devoted to serving the children of the world, Pat elected to serve on the Special Events Committee and the Special Olympics Committee. Almost immediately, opportunities became available for volunteering at Special Olympics events. Most recently, Pat served as a "Line Assistant" for flag football at Northern Illinois University's Huskie Stadium and for the Fall Games' Volleyball Tournament at Harlem High School. Teams from all around Northern Illinois came to play. The teams and coaches were professional, and there was a great show of sportsmanship. Pat reports these activities are sharpening her throwing skills! One of Bill and Elisa's favorite continuing legal education opportunities is the annual two-day fall seminar coordinated by the Illinois Credit Union League. The seminar covers important legal developments, with a special focus on issues that are particularly relevant for businesses and financial institutions. The presentation on recent court cases was perfect for late October; many decisions are downright scary for employers. Pat recently joined the Alpine Kiwanis Club of Rockford, one of the oldest Kiwanis clubs in the world. It was chartered more than 100 years ago. The local club's members have provided countless hours of service to children and contributed more than one million dollars to youth organizations in the Rockford and surrounding areas. Its goal is making life better for the children and youth of the community - "Where One Can Make a Difference." Pat enjoys making a difference; she is certain to quickly contribute a positive impact on kids in the community. 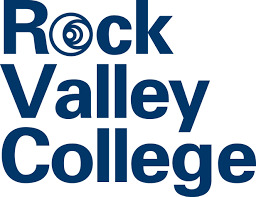 Again this year, Bill was asked to participate in the Education Works Summit hosted by the Community Foundation of Northern Illinois at Rock Valley College. The summit brings together superintendents and key leaders of education from 29 area school districts and the community. Together they considered and planned new ways to more effectively teach young people the skills they will need to be happy, healthy and productive members of the community. 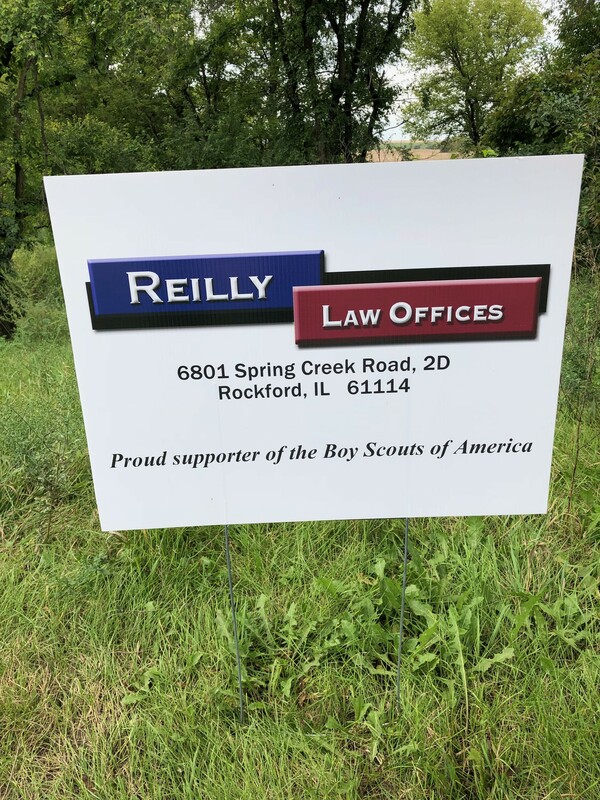 Again this September, Reilly Law Offices sponsored a station at the local Boy Scout Council's fundraiser to support the effort to bring the principles of Scouting to "At Risk Youth" in the Rockford Area. Bill stated that Reilly Law Offices is proud to help more boys and young ladies raise their right hand and proclaim they will be "trustworthy, loyal, helpful, friendly, courteous, kind, obedient, cheerful, thrifty, brave, clean, and reverent." 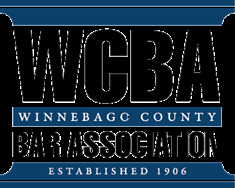 Both Elisa and Bill participated as course instructors at the Winnebago County Bar Association's Commercial Law Section seminar designed to train experienced attorneys in new developments of the law. Elisa spoke on the Consumer Financial Protection Bureau, an agency of the United States government responsible for consumer protection in the financial sector. Bill spoke on the Fair Debt Collection Practices Act, a federal law that limits the behavior and actions of third-party debt collectors who are attempting to collect debts on behalf of another person or entity. They both noted it is a lot of work to prepare and present a topic in front of their peers, but they agreed it helps keep them on top of important new developments. Bill was elected by the Blackhawk Area Council to represent the local Scouts and Scouters on a national level as the Boy Scouts of America embarks on its newest adventure of inviting girls and young women into more of its Scouting Program. 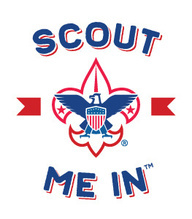 Beginning in 2018, girls are fully participating in the Cub Scout program. They will soon be followed by young women participating in the Boy Scout program, just as young women have already been doing in the BSA's Venturing, Sea Scouting and Exploring programs. Bill says there is a lot to consider when tailoring the action-based Boy Scout program to young women, but there is a huge demand and need for this program to support young women today. 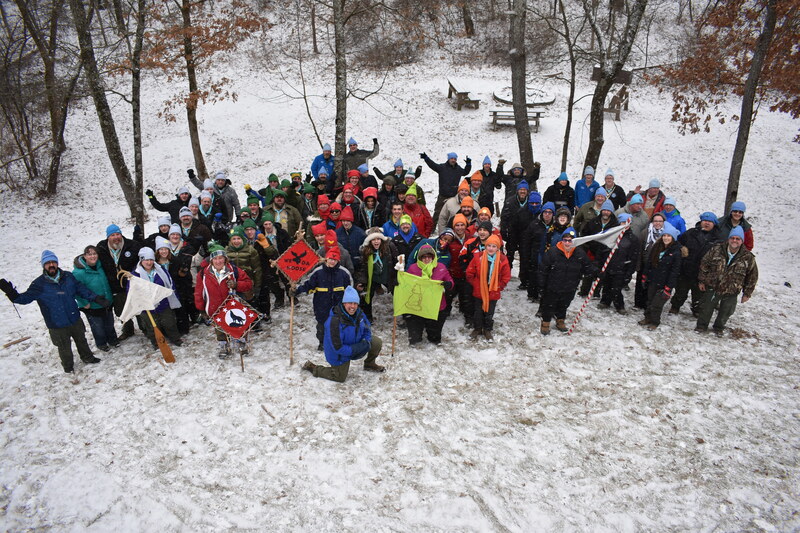 Bill participated in a course over the winter of 2017-2018 to train Scout leaders and older Scouts to prepare other Scouts and leaders to enjoy, not just survive, a winter tent-camping experience. Bill noted that winter camping is a wonderful way to teach young men and young women the importance of planning ahead and then enjoying something that many people would find undesirable. He said that everyone learned something, especially when things did not go as planned. He added that although he was prepared for below-zero weather, he certainly did not complain that the lowest overnight temperature only dipped to 12 degrees! 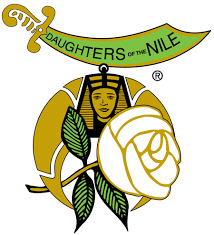 Daughters of the Nile is an international fraternal organization of 22,000 women who, in association with Shriners International, support Shriners Hospitals for Children. The Daughters of the Nile maintains permanent endowment funds to benefit the network's 22 hospitals renowned for providing the highest quality care to children with neuromusculoskeletal conditions, burn injuries and other special healthcare needs within a compassionate, family-centered and collaborative care environment; providing for the education of physicians and other healthcare professionals; and conducting research to discover new knowledge that improves the quality of care and quality of life of children and families. For many years Pat Kasmar, our office manager, has been an active member of the organization. This year Pat serves on the Tray Favor Committee crafting meal tray favors for children hospitalized for care. 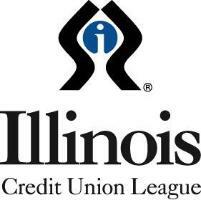 Again this year, Bill and Elisa both attended the Illinois Credit Union League’s two-day seminar on issues affecting Illinois Credit Unions in particular, and other financial institutions and businesses in general. They attend the conference annually since they both say it has been their most valuable reoccurring continuing legal education conference. 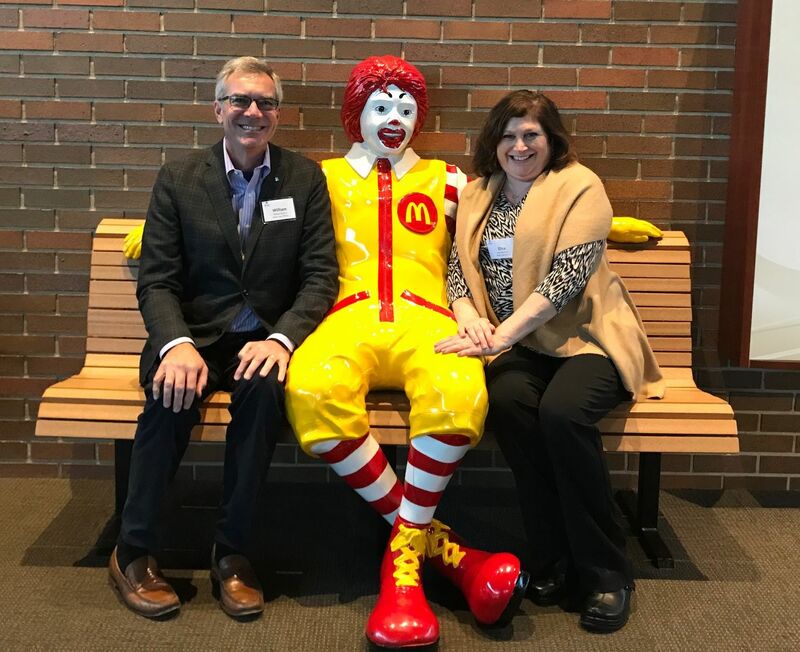 The location of this year’s conference, ICUL’s 40th Annual Attorneys Conference, was Hamburger University (an actual building) on the McDonald’s Corporate Campus in Oak Brook. The facility is filled with extraordinary artworks, personal items of Ray Kroc, and historical artifacts from McDonalds through the years. Elisa was honored to be selected to meet with students aspiring to be attorneys at the annual Academy Expo presented by Alignment Rockford. At the Academy Expo she met with ninth graders from all over Rockford to answer their questions about the practice of law and how to become an attorney. She said it was gratifying to meet with so many excellent students with an interest in not just practicing law, but also in assisting what they described as friends and relatives in need of legal help. In June and September, Bill assisted the Community Foundation of Northern Illinois as a facilitator to bring together school district leaders, community leaders, and student leaders to discuss the alignment of today's educational system, the students in that system, and the needs of local employers. The plan is to use discussion, mutual goal setting and financial incentives to better align the educational system for the benefit of all stakeholders in the community. Bill acknowledges that it is a long road to success, but he says that as long as the road is being travelled we have progress toward our goal. Bill participated in the announcement of the Community Foundation of Northern Illinois' $35,000 grant to the Rockford Park District Foundation for the Bruce Munro: LIGHT exhibit at Nicholas Conservatory & Gardens. The exhibit is a unique art installation expected to attract thousands of visitors to the gardens. Bill serves as a Trustee of the Foundation and is Chair of the Arts and Humanities Grant Committee. 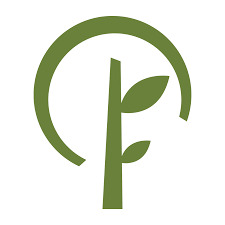 The Community Foundation of Northern Illinois serves as a catalyst for giving in order to attract, grow, and preserve an endowment for the needs of northern Illinois. Since its founding, CFNIL has granted more than $60 million for charitable purposes. Bill was selected and recruited by the Seventeenth Judicial Circuit Court of Illinois on behalf of the Illinois Supreme Court to serve as a mentor during 2017. The Court's mentoring program creates opportunities for experienced lawyers to provide professional guidance and share their judgment and skills with lawyers in their early years of practice. 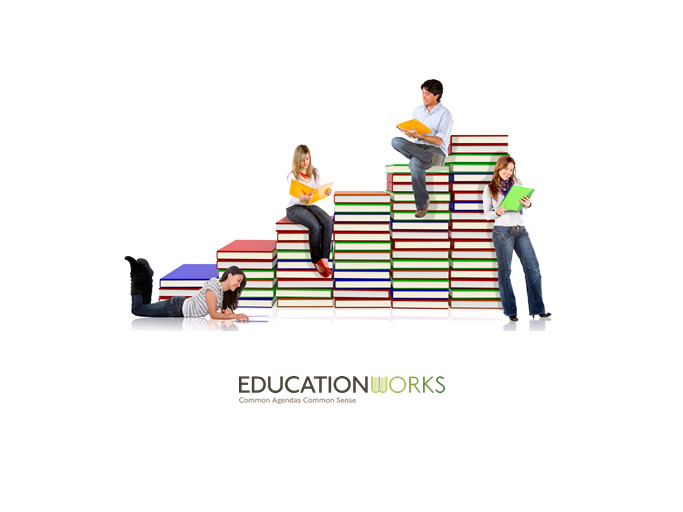 The program uses a flexible structure for practical learning within the context of the mentoring relationship. The stated mission of the program is to promote a culture of civility and inclusion, in which Illinois lawyers and judges embody the ideals of the legal profession in service to the administration of justice in our democratic society. After several years as the friendly face behind the front desk of Reilly Law Offices and as the most likely person to answer the office telephone, Teri has opted for retirement to watch her grandchild Jack. 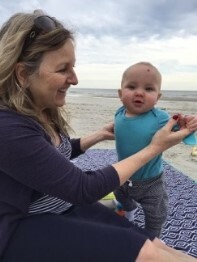 She says she enjoyed the office and all the things she learned, but that it is hard to compete with the opportunity to babysit her only grandson! Teri will be missed by everyone in the office, by our clients, and by the many people who visit the office. Best wishes Teri! Trisha was born and raised in Rockford. After graduating from high school, she explored career options and accepted her first position at a law office in 2013. Trisha identified a keen interest and aptitude for the legal field. While continuing to work at various positions in law offices, Trisha enrolled at Rockford Career College and obtained her Associate in Applied Science as a Paralegal. Trisha and Kyle have one son, Bryce. 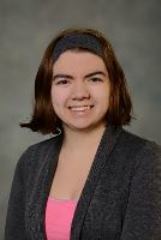 In her spare time Trisha enjoys reading, writing, and playing video games with family and friends. Trisha says she welcomes the opportunity to expand her legal knowledge at Reilly Law Offices and that she looks forward to helping our clients conquer legal challenges and achieve personal and business goals. Teri has coordinated the Angel Gift Project at Christ United Methodist Church for the last three years. This is a carefully organized effort that involves many people over the course of several weeks. This project works with six agencies in the community that help people in need, such as the elderly, people with disabilities, low income residents, high risk families with children under the age of three, youth struggling with emotional or mental health problems, at-risk youth, and children of incarcerated or institutionalized parents in this area to have a better Christmas by providing a gift or two. The congregation of the church provided gifts to over 250 recipients in the community this year. Teri says it's a blessing to work on such a worthwhile project. Elisa previously served as the President of the Rockford Health Careers Foundation - Winnebago County Medical Society Alliance. Her term was fulfilled, but she was recruited back to serve as the representative of the legal community on its board of directors. Congratulations Elisa! Established in 1954, the Rockford Health Careers Foundation was formed to promote health care education in Winnebago County. 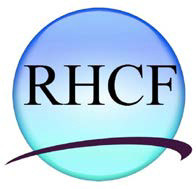 Each year, RHCF awards scholarships to students in many health related fields, including medicine, nursing, radiography, respiratory therapy, pharmacy and public health. 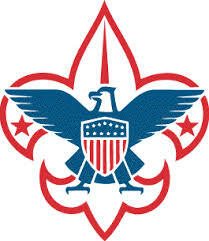 Bill was honored to be chosen as a member of the Scout Executive Selection Committee of the Blackhawk Area Council. The committee is tasked with identifying and recruiting an excellent professional Scouter to lead the council following the retirement of Bill's close friend Don Kinney on December 31. Bill says that Don will leave the proverbial big shoes to fill, size 13, but with the council in excellent shape due to Don's leadership, there will be many excellent candidates to choose between. Bill is a trustee of the Community Foundation of Northern Illinois. Its mission is to attract, grow, and preserve an endowment for the current and future needs of the people of Northern Illinois. At a recent retreat in Rockford, Bill gave a presentation on identifying and avoiding conflicts of interest, enlightening and entertaining the board and staff of the CFNIL with a variety of vignettes. Federal and state law and regulations continue to change, and new cases interpreting those laws and regulations are decided daily. To maintain their expertise, Bill and Elisa regularly attend continuing legal education classes. This fall they attended a two-day conference in Oakbrook, Illinois sponsored by the Illinois Credit Union League. 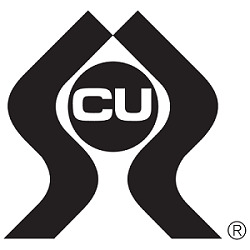 The presentations addressed matters specific to the operation of credit unions and to all business owners in general. Support for Scouting through Sporting Clays. On September 10, 2016, Reilly Law Offices joined with friends at Rock Valley Industries to support the efforts of the Blackhawk Area Council, Boy Scouts of America, to bring Scouting to inner-city youth. 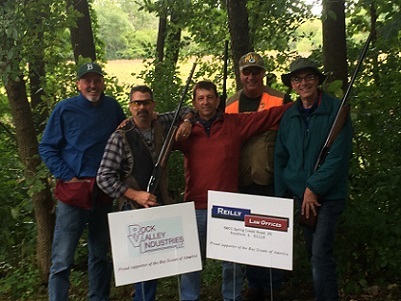 Not only did the office support a sporting clays station, Bill participated in the event. He reports having a great time, but that "too many clays were spared to fly another day." For thirty years, credit unions have been a significant portion of Bill's practice. Reilly Law Offices supports the mission of credit unions to serve their members (owners) by providing a safe, personalized way for members to save for their financial goals and to borrow to meet their financial needs. 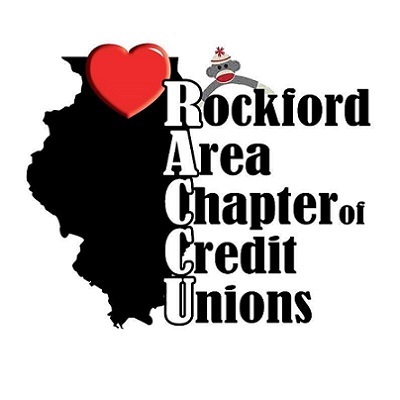 As part of supporting the Rockford Area Chapter of Credit Unions (RACCU), Reilly Law Offices was a sponsor of the RACCU's Golf Event held on September 8, 2016. Play on credit unions! The tenth anniversary of Reilly Law Offices introduces our new website design. We believe new design is authentic and personalized. 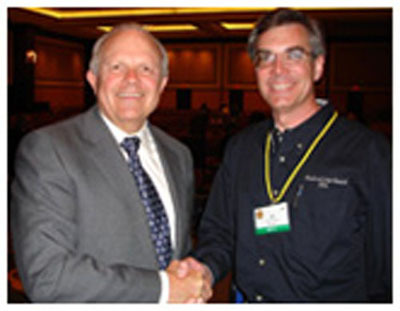 Nevertheless, for our first entry we reach back to the first entry of our original website as a nod to tradition and to again recognize the incredible achievements of a great American entrepreneur, adventurer and Eagle Scout, Steve Fossett.